How television's telling of the Crusades has changed over the last 60 years and our interpretation of this medieval story has been influenced by modern political and social change. 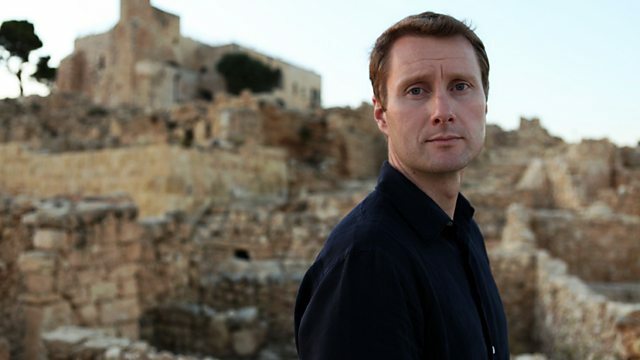 Historian Dr Thomas Asbridge explores the BBC's archive to reveal how television's telling of the Crusades has changed over the last 60 years. Using footage from Crusade documentaries shot during the Vietnam era, the Palestinian Crisis, the First Gulf War and the more recent War on Terror, he reveals how our interpretation of this medieval story has been influenced by modern political and social change. Thomas highlights the alternative Arabic perspectives on the Crusades, and asks whether this 1,000-year-old story really does cast its long shadow over the modern world, as so many have claimed. With contributions from Monty Python star and medievalist Terry Jones, Washington economist JK Galbraith, and historians Simon Sebag Montefiore, Dr Peter Frankopan, Prof Konrad Hirschler and Dr Fozia Bora.